The Asian Human Rights Commission (AHRC) has received information from media reports and grassroots activists. These activists are engaged in rescue and relief operations for the earthquake victims in Nepal who are facing imminent threats of starvation and epidemics. Things are particularly grave for those in distant mountainous villages. Much of the relief material reaching Nepal from across the world is already insufficient to meet the needs created by this massive calamity. It has already claimed more than 4300 lives, and counting, and has displaced millions. Little, if any aid has reached those in remote and areas difficult to access. There is a total breakdown of sanitation services creating the risk of an outbreak of disease. Many bodies of the victims are scattered all around and are unburied causing further risks to health. The massive earthquake, measuring 7.9 on the Richter Scale, that struck Nepal on April 25 has claimed more than 4300 lives. It has displaced millions. Both these figures may be grossly underestimated as rescue and relief teams have yet to reach far-flung mountainous areas that are treacherous to reach. Access roads connecting them to Kathmandu and other urban centers have been badly damaged by the earthquake and are seriously congested by relatives returning to their villages. Although the world community has responded urgently and immediately, the steady supply of relief material, especially water, food and medicine is still insufficient to match the needs. The most affected districts like Gorkha, Dhading, Lamjung, Kavre, Nuwakot, outside of Katmandu, have not yet been reached leaving them to fend for themselves as of now. Reports indicate that all the foreign expert teams that have reached the country including those from India, China, and Pakistan have been deployed exclusively in Kathmandu while those from the U.S.A. await deployment. A breakdown of the sanitation services in all of Nepal is critical, but the situation is dire for those in remote, hard to access areas. Those bodies still buried under houses are a further source of disease for survivors. It is imperative not to delay their extrication and the safe, dignified disposal of their remains. Please express your concern and request the authorities to provide rescue and relief services to the earthquake victims most particularly those most vulnerable caught in the remote areas of Nepal. 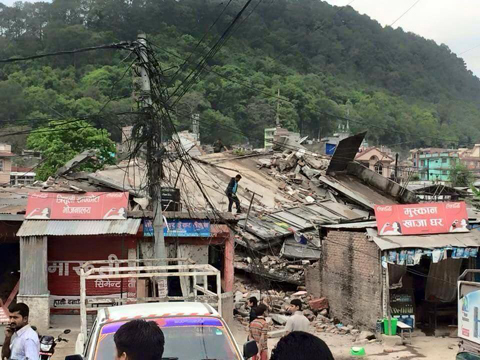 I am writing to you with grave concern over the plight of victims of the earthquake in Nepal. The massive earthquake, measuring 7.9 on the Richter Scale, that struck Nepal on April 25 has claimed more than 4300 lives. It has displaced millions. Both these figures may be grossly underestimated as rescue and relief teams have yet to reach far-flung mountainous areas that are treacherous to reach. Access roads connecting them to Kathmandu and other urban centers have been badly damaged by the earthquake and are seriously congested by relatives returning to their villages. 1. Rescue and relief teams are deployed in remote districts of Nepal as quickly as possible. 3. Arrangements are set in place immediately for a safe and dignified disposal of bodies of the victims. 4. Arrange clean water and sanitation services without delay.